DO YOU WANT TO BE PART OF THE ULTIMATE FOOTBALL EXPERIENCE? IPDA OFFERS THE OPPORTUNITY FOR CHILDREN OF ALL AGES AND FOOTBALLING ABILITIES, TO DEVELOP AND IMPROVE YOUNG PLAYERS ABILITY AND TECHNIQUE WHILST INSPIRING AND SHARING OUR PASSION FOR THE BEAUTIFUL GAME. 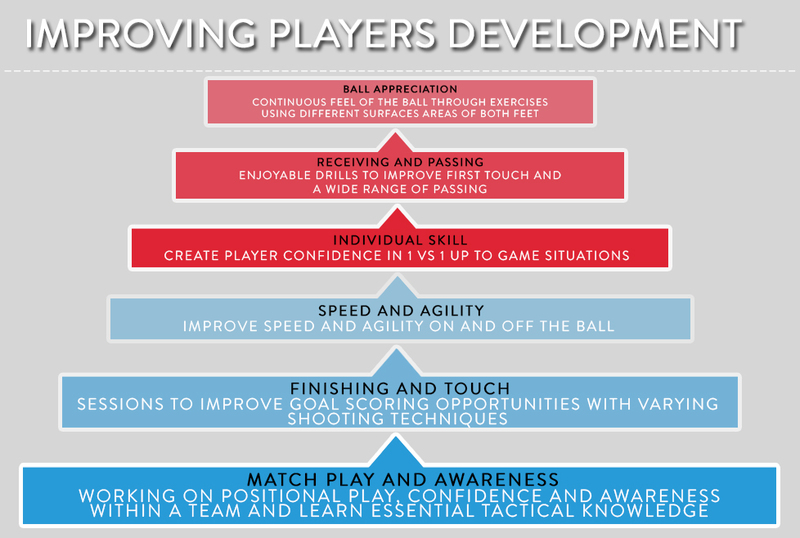 OUR PROGRAM FOLLOWS THE DEVELOPMENT PHILOSOPHY THROUGH A 7 WEEK CYCLE, DESIGNED TO HELP IMPROVE ALL PLAYERS INDIVIDUALLY. PLAYERS WILL BE COACHED ON TOPICS SUCH AS BALL ARTISTRY, FINISHING, PASSING AND RECEIVING AND MANY MORE FUN AND EXCITING TOPICS. THE ACADEMY OFFERS A VARIETY OF TECHNICAL DRILLS TO HELP DEVELOP BOTH THE PHYSICAL ability of the player and their understanding of the game while ensuring they have the best time possible whilst playing. our CURRENT courseS run for 7 weeks and for new customers include a full ipda kit (t-shirt, shorts, socks) and bag (sponsored by boing zone). each PLAYER will be invited to attend our end of course party which will be at boing zone trampoline park or inflatable zone birmingham. SPECIALLY DESIGNED FOR 6 - 7 YEARS, OUR YOUTH ACADEMY FEATURES PLENTY OF FOOTBALL, GAMES AND FUN WHILST LEARNING NEW SKILLS AND TECHNIQUES. SPECIALLY DESIGNED FOR 8 - 9 YEARS OUR OUR JUNIOR ACADEMY CHALLENGES PLAYERS TO PROGRESSIVELY DEVELOP THEIR SKILLS AND CONFIDENCE. SPECIALLY DESIGNED FOR 10 - 12 YEARS OUR SENIOR ACADEMY WILL CHALLENGE PLAYERS TACTICALLY, WHILST DEVELOPING THEIR SKILLS AND FOOTBALL EDUCATION. SPECIALLY DESIGNED FOR 13 - 16 YEARS OUR TEEN ACADEMY OFFERS THE FOUNDATION TO MOVE FORWARD AND PREPARE TO MOVE INTO ADULT GAMES.